Tonight is the sixth in our series of workshops for juniors on the college search and application process. The most important thing of all: get good grades! Register for the May SAT. Continue SAT prep using the Khan Academy site. Meet 1-on-1 with your college counselor. Consider summer opportunities on college campuses. Log in to Family Connection and take the Junior Year College Interest Survey and the Do What You Are inventory. Meet with Mrs. Walker to develop your senior schedule. Begin taking a more serious look at colleges and universities. Begin planning college visits. Spring break is a great time to visit colleges and universities! Develop a preliminary list of colleges that interest you. Write or email to request a viewbook and additional information. Add the colleges to your “Colleges I’m Thinking About” list. Have a summer plan. Look into summer jobs or apply for special summer academic or enrichment programs. Colleges love to see students using their knowledge and developing their skills and interests. Most important: stay busy this summer. Next we will get down to the purpose of the meeting: how to make the most of the college visit. I’ll out a great resource written by William Shain, and Mr. Reed will go through a a collection of advice on the college visit. This video is a great overview of the college visit. I’ll conclude by observing what students in a recent College Admission 101 Spring Program noticed: that a lot of the college campus tour is the same, regardless of the campus. Finding what makes each college different is what’s most important. 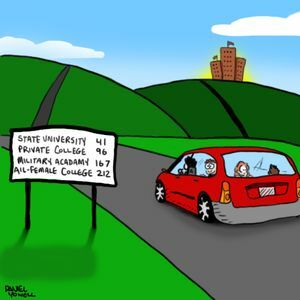 Here is a humorous look at the college tour. I really like your blog as we know that College visits are a great way to check out potential schools and light a motivational fire under prospective applicants. They also help to get students excited about going to college. A college visit can also help students understand what the college admissions process is all about and what is required of them in order to be successful. There is also no substitute for a personal visit to help students gain a better focus for their applications. Keep posting this kind of beneficial blogs!! !